As we all know, understanding the balance between environmental factors and what exactly triggers our acne feels a little bit like chasing rainbows! Whenever it seems like we’re getting close to an answer, we get a massive breakout that undoes all of our “progress.” That’s the thing about treating acne – there is no one-size-fits-all cure! This sentiment ties in perfectly with the complicated relationship between acne and vitamin B. When it comes to skin health, the B vitamins most certainly play a role. The vitamin B complex are a class of water-soluble vitamins that aid in cell metabolism. According to a study a Vitamin B7 or biotin deficiency is seen to cause many skin conditions and even alopecia. These study results are proof that biotin does promote skin health. However, when consumed in excess it can actually cause acne breakouts. Let me explain; vitamin B5 or pantothenic acid is absorbed through the same receptors in the intestines as B7, meaning if you consume too much of one, you can become deficient in the other, and a deficiency in either can lead to skin diseases/ conditions such as acne. This is why taking a biotin supplement is actually not good for the skin, because in doing so you are essentially choking out other vitamins your body needs. Vitamin B12 (cyanocobalamin) may also cause acne when consumed in excess. 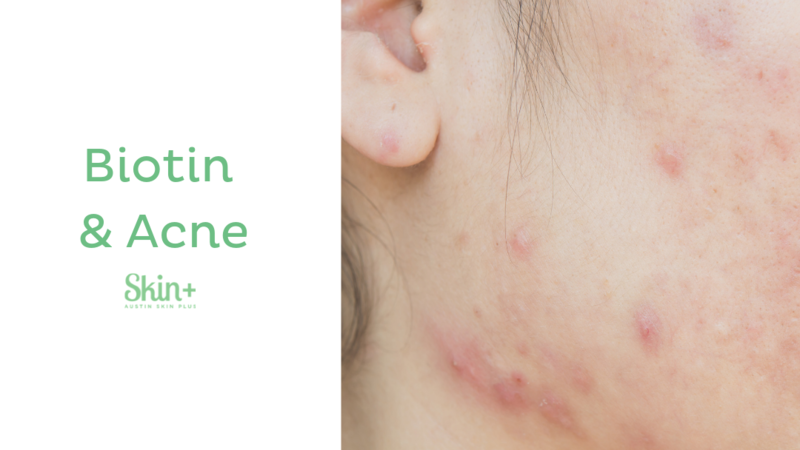 A Science Translational Medicine study has shown that supplementing with B12 can influence P. acnes; a common bacteria found in the pores of acne sufferers, to produce a chemical that causes inflammation in acne. The fact of the matter is, we need the vitamin B complex not just for our skin health, but for the health of entire bodies! And the secret to fueling our bodies with the nutrients we need doesn’t necessarily lie in a supplement. Simply put, trying a well-balanced, healthy diet is a good starting point. The proof is in the pudding…. literally! Regarding any nutritional supplements, we do recommend that you consult with your doctor. Rooting out the cause of acne can be a daunting process. When we hear about a vitamin that is good for treating acne, we start to feel eager to self-treat the problem! This can be dangerous, and you may be causing more harm than good. Nothing is a magical acne cure, the answer is a culmination of healthy lifestyle choices, a targeted skincare routine, consistency, and patience. Leave it to the professionals to help you conquer your acne, get an Acne Coach to get you started in the right direction. We can help you with a full review of what your needs are, with a custom skincare regimen!